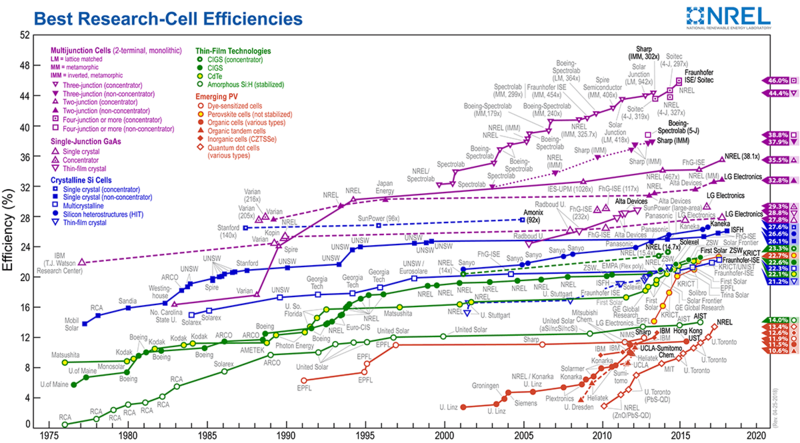 Which solar-electric technology had the highest EROEI? Energy Returned On (Energy) Invested, also known as EROI and as EROEI, has become something of a fashionable metric *but see footnote. It is calculated by dividing the total energy delivered by the system throughout its whole lifetime, divided by the total energy required to build, operate, maintain (and ideally decommission) the system. Please refer to specific peer-reviewed energy studies where possible. are all in scope, along with anything I haven't heard of that converts sunlight into electricity, without going through convolutions such as biomass, wind or wave. Attempts at doing it purely through prices do not answer the question: price is emphatically not a useful measure of total energy input, because the factors of production (land, capital, enterprise, labour) are not zero-cost, and because the ratio of energy to other inputs varies hugely by manufacturing technique and by product. So that approach is explicitly out of scope, because it's just plain wrong. others consider that as long as a generation source has a value greater than one, then the economics matter, and the EROEI does not (except solely for its impact on the economics). IF EROEI is less than one, then it can still be useful: not as a generation source, but as a store or conversion of energy. EROI estimates vary widely. This is because of differences in the method of calculation, scope of the study, installation location, assumed lifespan of a panel, etc. This also makes it relatively easy to manipulate EROI calculations. 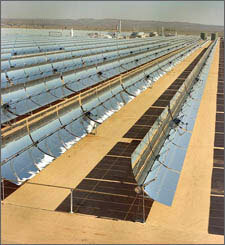 photovoltaics for the Southwest of the US. I'm not sure how reliable any of the mentioned numbers are. The truth probably lies somewhere in the middle. This seems to be confirmed by the results of this 2015 meta study where they reviewed 232 studies published between 2000 and 2013. 23 studies that met their criteria were analyzed further (11 on mono-Si, 11 on poly-Si, 7 on amorphous Si, 11 on CdTe and 8 on CIGS). 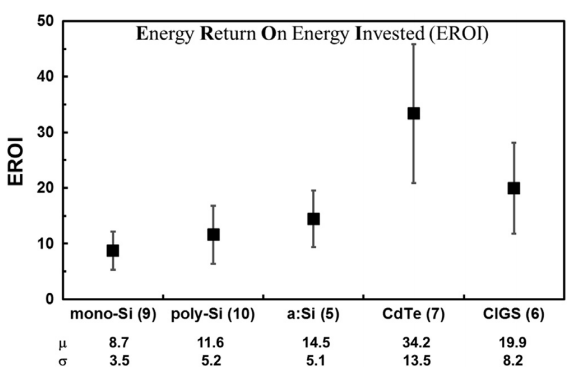 The conclusion was that the mean harmonized EROI varied from 8.7 for mono-crystalline silicon panels to 34 for cadmium telluride panels (see also the picture below). Sadly they didn't investigate CSP or CPV. http://www.ce.cmu.edu/~gdrg/readings/2005/12/07/Williams_EnergyChemicalUse.pdf following the above link you will find there on page 2(185):"According the 1997 National Technology Roadmap for Semiconductors, average electricity consumption was 1.4 kWh per square centimeter of silicon wafer processed". I do not think figures are much lower now. Besides, they are do not include assembly, transportation and buffer. If there was EROI=1 it would be a magic. Solar EROI is far below 1. 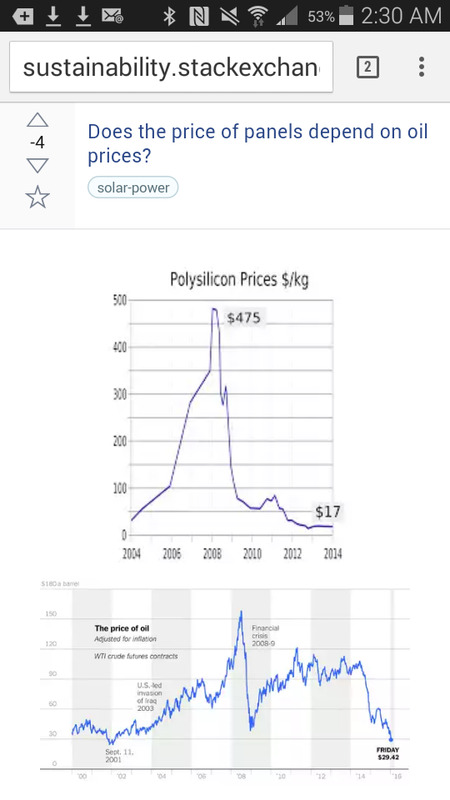 The above-one EROI estimates are due to various shenanigans, such as excluding infrastructure costs..
You can also see that solar prices just track oil prices. The comments below also ignore infrastructure costs and use industry-reported data despite obvious conflicts of interest. Not the answer you're looking for? Browse other questions tagged energy electricity solar-power life-cycle-analysis photovoltaics or ask your own question.